Netbooks are brilliant. It's like having a really crap PC you can take anywhere. The biggest factor in netbooks' crapness is usually the RAM. Manufacturers don't like putting too much in a netbook, for fear that it might actually make it good, so they tend to shove a meagre 512MB in there. It's like buying a puffin without wings. 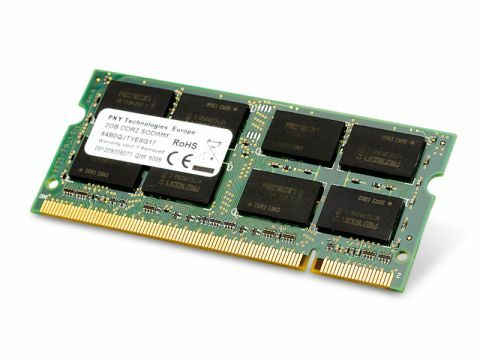 Fortunately, PNY is on hand to fill the gap in the market with the Optima 2GB SODIMM module. At £20, it's a steal, and it'll make your netbook fly. Not literally. Although our memory latency and bandwidth benchmarks were slightly lower, the fact that your PC's got more memory capacity means that it won't struggle to display Pac-Man, or a low resolution JPG. There is a slight flaw in PNY's marketing. This module is said to run at 800MHz, which is great, apart from it won't actually achieve this speed on most netbooks. The problem is that most netbook's BIOSes are locked down, so you can barely even change the time and date, and you may as well forget about changing your memory clocks. Obviously laptops tend to have more BIOS options, so you can happily stick it in there. If you really want to make your tiny PC of woe run faster, we'd recommend you check your BIOS before you invest in super speedy RAM. If you can adjust the clocks, go for the 800MHz stuff. If not, stick to the even-cheaper generic memory.